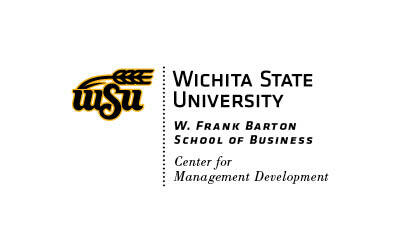 The Center for Management Development in the W. Frank Barton School of Business at Wichita State University provides quality professional education to individuals and corporate clients, in order to enhance careers and foster workforce development. CMD acts as a strategic partner with organizations to provide you with current business knowledge and the best practices to develop your leaders and employees. The experience of our staff and trainers, our association with Wichita State University, and its vast resources make us your perfect training and development partner. Engaging, certified trainers with decades of experience delivering training in Kansas and the U.S.
Will always act with the utmost integrity and in the best interests of CMD and their fellow employees. Are responsible for satisfying customers and committed to exceeding customer expectations. Are committed to continuously improving processes, products and services while utilizing solid business practices. Recognize that the output of the team is greater than any individual’s single contribution and will cooperate to achieve our mission. Are business professionals dedicated to maintaining a first-class image. Are encouraged and given the opportunity to grow both personally and professionally. Will communicate openly and honestly and will respect the opinions of others. Drawing from a staff of over 350 experts in fields ranging from business to engineering; from information technology to copy writing; we offer one of the largest, most comprehensive training resources in the region. Wichita State University is the largest University in southern Kansas, boasting a student body of over 14,000 students. Located in Wichita, Kansas, WSU plays a significant role in the area Aerospace industry, which holds the distinction of being the Air Capital of the world. The campus of Wichita State University is a smoke-free campus. Attendance at CMD training sessions grants permission for CMD to photograph and/or video all participants in the training sessions, to use in any form as a part of future publications, printed materials, advertising and web content used to promote CMD and that such use shall be without payment of fees, royalties, special credit or other compensation to the participant.